In fall of 2017 I was able to visit the set of CBC’s Heartland for a couple of days. 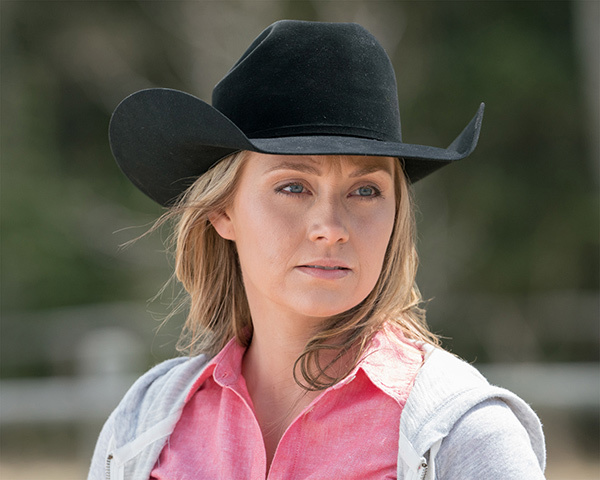 The following is my interview with Amber Marshall, who plays Amy Fleming. 1. How do you keep your joy in horses? You’ve been on the show for so long, and you’ve been into horses for so long. I still love horses, there’s no secret about that. This year is especially rewarding for me, because Amy wasn’t riding at all last year. To be back on a horse on Heartland felt really good, so my joy wasn’t acting. 2. What can fans look forward to in Season 11? It’s fresh, it’s new. Those who have been true Amy/Ty fans for a decade now get to see them in a whole new light, and see their relationship in a whole new way. I think that’s really important for not just young families, but for anyone who enjoys the show, to see a different dynamic between them. 3. What is your favourite type of scene to film? Definitely the horse scenes. The liberty horse scenes are still my favourite to do, but I like when there’s some emotion with horses. I love when Amy is upset about something and she looks to her horses for that support. I find that those scenes are really rewarding for me, and it keeps me grounded as an actor because horses – they’re just real. They’re in the moment with you, and they give you back exactly what you’re giving them. It’s really something that makes Heartland special – we act with these amazing animals, they make you sane, and make you stay true to your character and to real life. 4. Have there been any new additions to your own personal herd? No…other than chickens and turkeys that come and go, but we don’t need to talk about them. I try to keep it fairly manageable because I work such long hours; it’s only fair to the animals that I keep it the same. 5. What’s your favourite part of Amy’s wardrobe? The fact that it’s comfortable and practical. I look at a lot of actors on different shows, where they have to be dressed up all the time, in very New York style garb. I’m really happy I don’t have to wear a dress to work every day. The wardrobe is very functional. 6. What are your thoughts on the graduation and growth of Amy as a character in Season 1, her losing her mom, to Season 11, her being a mom? It’s very rare, in a series, that you get to tell a story for this long. That’s something that makes Heartland so special. For viewers to be able to grow up with Amy, and see her over the years, of a very crucial point in her life, and to overcome those battles, and now being a mom, having that care and that passion for a new being, and still wanting to remember her mother…she can pass down traditions and the love of horses. 7. What do you find most interesting about acting? I’m not someone who could ever have a day job. I love the spontaneity of acting, of different locations … I love being able to just play every day, it’s not something that very many people get to do. For me, it’s about keeping things new and exciting, never becoming stale. 8. Other than Remy, who else do you think we should see on Heartland? My cats still come in and out of the vet clinic; in cages in the background in a few scenes this year. We get to see my pony Talon again, who plays Monty. My turkeys are making an appearance at the Granger Wildlife Centre. 9. What was your favourite scene in Season 10? It’s hard to pick out a scene, because what I really love are the scenes where I ride. 10. What storyline would you like to see explored? With a show that’s gone on over a decade, there have been so many stories told. That’s the struggle that we face, is to find new, creative stories that have never been seen before. My favourite stories that are told are Amy, and horses, and finding that Heartland magic. I found that – not that it was lost, but when Amy became pregnant, she wasn’t riding, her confidence took a step back. For me, I thought that was really interesting. It gives her a chance to grow. That’s the thing in a series, your character, they’ve come so far, and then what do you do? You have to have them take a step back for them to grow further. A lot of fans were really upset, asking why Amy wasn’t doing the same horse whispering she used to do, how come Georgie is taking over this horse stuff … I think that’s needed, to allow Amy that moment to say, “I miss this. This is really what my passion is.” Without that, you have nowhere to go. Heartland is available CBC on Sundays, at 7 p.m. (7:30 p.m. in Newfoundland).